What makes it special? Experience authentic Alchemist Suite in the former residence of the famous Emperor Rudolf II and his famous astronomer Tycho de Brahe; take a taste of harmonious blend of traditional elegance and contemporary luxury embellished with unbeatable stunning views of Baroque Palace Gardens and city of Prague, the City of 100 spires like on the palm of your hand. Stepping into the Golden Well Hotel is like traveling back in time and exploring history first hand. 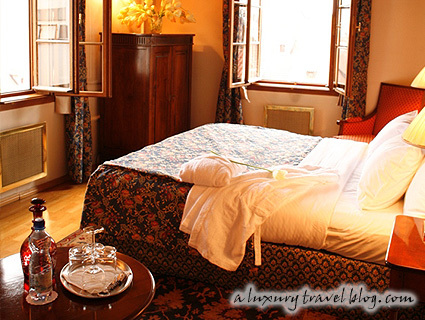 The property is gently nestled between the Prague Castle and baroque Ledeburg Gardens. This truly remarkable location enhances the rooms most of which have spectacular views of the Gradens and charming roofs of Lesser Town. Authentic reproductions of original antique pieces from XVII, XVIII and XIX centuries have been skillfully crafted by prestigious Richelieu furniture designer which adds a specific charm and refined timeless elegance to the hotel. 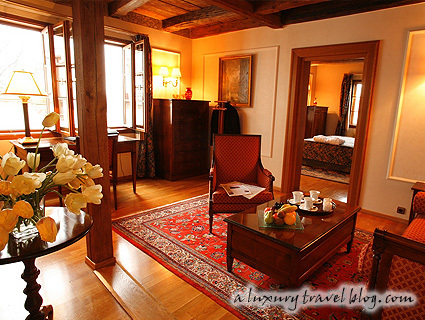 Each room has its own unique layout, design and character. Enjoy in-room facilites inlcuding pillow menu, Egyptian Cotton Linens, luxury bathrooms all with heated floors and Jacuzzi, Molton Brown amenities, Wi-Fi high speed internet access and even much more.